OMG, look at those Burger King hands! Hand size is kind of a big deal at the Combine, especially at certain positions, like quarterback and wide receiver, for obvious reasons. And it is absolutely something that NFL personnel people monitor. Former Eagles coach Chip Kelly, for example, once said that he cares more about hand size on a quarterback than height. If the quarterback is not tall, look at his hands. That is the biggest coaching point to finding a quarterback. How big are his hands, and how well can he control the football? The heigh of the quarterback is not the important thing. No one playing quarterback throws over the line. They throw through lanes in the lineman. The important thing is the size of his hands. Fumbles would be an obvious concern for a quarterback with small hands, as well as the ability to grip and throw a football in harsh elements. It has become such a talking point here at the Combine that it was the first question standout quarterback prospect Jared Goff faced in his media interview. 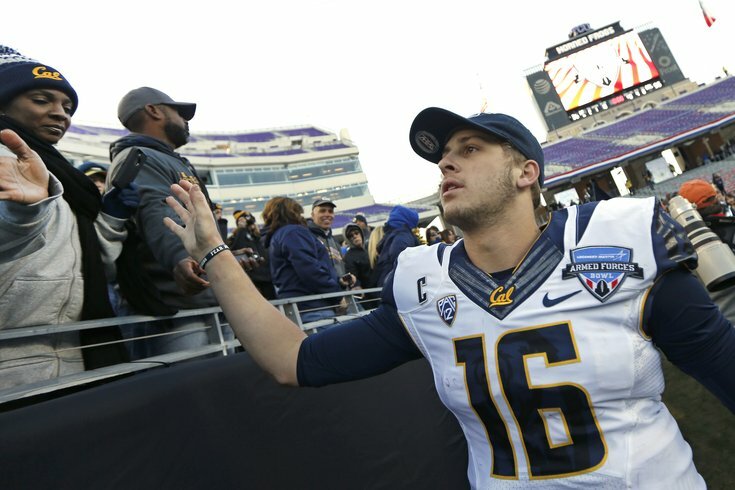 "I just heard (that I have small hands) yesterday," said Goff. "I've been told I have pretty big hands my whole life. I heard I had small hands apparently yesterday. But I've never had a problem with that and I don't expect it to be a problem." Many would assume that it is just human error that is to blame for what is a fairly significant gap in hand measurements. Not so. The reason for that growth is because players are now seeing massage therapists to get more flexibility in their hands so they stretch out wider, and therefore measure longer. Arkansas quarterback Brandon Allen, for example, measured in with the smallest hands on all quarterbacks competing at the Combine, with 8 7/8" Burger King hands. Allen said his hands were measured at 8 1/2" at the Senior Bowl, and he is trying to get them up to 9". "Basically, all these muscles in my hand are very tight," said Allen. "The massage therapist told me. And so he's working out these muscles so that my hand kind of opens up a little more when they stretch it. A lot of guys, when you see them stretch their hands, their thumb comes down here. (Allen demonstrates a spot when his thumb would be if his hand were more flexible), and my thumb is very tight to my fingers, so that's kind of where they measure, from here (thumb) to here (pinky). And so it's really tight and they're working to get these muscles loosened up. I'll try to hit 9" or above at my pro day, so we'll keep getting them bigger." Artificially growing his hands has actually been a big part of Allen's routine in preparation for the draft. "I had five sessions with (the massage therapists), and a lot just on my own, working it, stretching it out, said Allen. "I almost got a half an inch so far. By my pro day, I'll be able to get that nine." Football is so dumb sometimes.